required to return three cards. report this fact to the home club. advertising displayed. Golf shoes may be worn in the competition room. required, then place your order with the Handicapper. 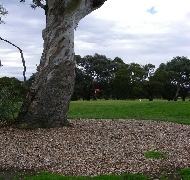 Yarra View Golf Club into disrepute. responsible for the overall cohesion of play for that playing group. Shout! (FORE) if there is the slightest possibility a ball may strike someone. when that player is making a stroke. Do not walk up on a player from behind; when that player is making a stroke. lines of vision at all times; and not impede a player's stroke. of putt, and avoid casting a shadow over the cup. Ensure that no-one is too close before taking a practice swing. Avoid causing damage to the course when taking a practice swing. and any damage caused to the green by a ball; is carefully repaired. Ensure no damage is done to the Greens when laying down flagsticks. Do not wheel buggies over greens, nor lay golf bags or umbrellas on greens. Replace flagsticks properly when leaving the green.